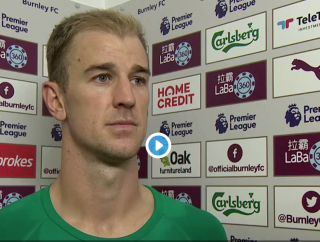 Burnley goalkeeper Joe Hart gave a post-match press conference explaining his penalty save to prevent Paul Pogba from adding to his tally for the season. Manchester United travelled to Turf Moor on Sunday where they beat hosts Burnley 2-0 thanks to a brace from Romelu Lukaku. Pogba had a chance to increase United’s lead, but had his penalty saved by Hart. The former Manchester City goalkeeper explained the process and how he’s been studying Pogba’s penalties of late. Manager Jose Mourinho handed penalty duties to the Frenchman this season, with Pogba scoring United’s first goal of the season against Leicester from the spot. Looking back at the penalty, it would be harsh to be overly critical of Pogba when he struck the ball with power and into the corner. Hart showed then that he can still be a top goalkeeper on his day. The England international has had a topsy-turvy few years after being pushed out of City by Pep Guardiola. He spent loans spells at Serie A outfit Torino before spending a season on loan at West Ham, though this summer Hart joined Burnley on a permanent deal. See the interview via BBC Sport below.